I was out and about yesterday in search of some vintagey Halloween decor. We have several pretty good thrift stores in our area- so I decided to stop in at a couple of them and see what was out there. Unfortunately, I didn't find hardly any Halloween decor at all, and the costume selection was not much better! I knew instantly it was a find- but had to checkout the frame and wiggle it to make sure it was good... and check the price they were asking! Okay, so I was definitely interested at that price. with a couple of fabrics that I knew I had in the armoire at home. The frame was sturdy & I loved the deep carved details. this is a nice sized chair. Might not be vintage - I don't know- but I love it anyway!! so I figured why not ask if they would go less. they dropped it to $20. It is marked Italy on the frame underneath. but this one almost has too good a finish to paint. 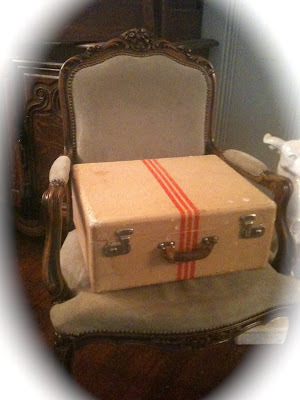 I also found this fabulous little old cardboard suitcase sitting on the floor. Gorgeous vintage yellow color and red stripe details!!! has no bottom -there is just the inside lining! it just is so darn cute! So a couple of new inspiration pieces to add to the loooong list of projects I have! Any thoughts on the finish on the chair? Link ups starting tonight right here at French Country Cottage! I'm with you, I'm not sure I'd paint this one. I mean, it would be beautiful all shabbied out too...but is nice as is too. And would look beautiful in your home either way. Tough call! 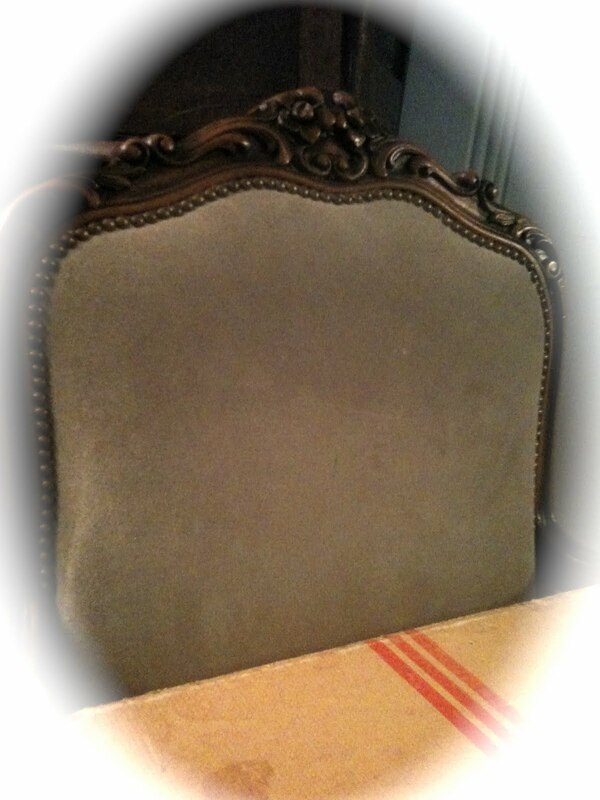 Hi Courtney - love your vintage finds! I was just working on a wooden headboard for my son's room. I was going to paint it but hubby said the natural wood was beautiful. I thought about it and agreed and simply freshened up the stain. It turned out beautifully. My point being that sometimes things are better left alone. The chair is gorgeous as is ... I would just change out the fabric! 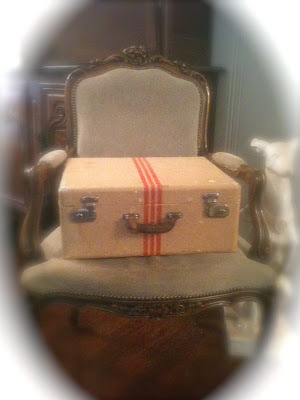 LOVE the vintage suitcase, especially with those fab. red stripes! It is a beautiful chair! Maybe just leave it for now and recover it with a shabby fabric, then, if you don't truly love it, paint it! Love the suitcase too!! Great finds! I love it too! !~ Both items are very neat. I do not think I would paint that chair...try new fabric first, that can make all the difference alone. I think since the chair came home with you for a song of $20 it is completely fair game to do anything you want with it. If you had a vision of the chair in a shabby style then I bet you a dollar that if you don't do anything to it, it won't take long for you to reconsider going with your gut instinct and grab the paint brush and glaze. Hi Courtney! Oh, I don't know...I feel torn about the chair! I probably wouldn't paint it because I would not know how to transform it like you can! It is so gorgeous as it is and with new fabric it will be even better. Maybe living with it for awhile will help you decide! Let me know what you end up doing with that suitcase because I have a couple I need to give some new life! Funny how shopping takes a twist sometimes. I love the chair. I say you sleep on it. The details and the carving are so pretty. I like it stained dark. Maybe just new fabric? Love the suitcase and understand why you could not leave (or live) without it. lol Can't wait to see where it ends up. Hi Courtney! Thanks for coming by Blueskies. Yep. You sure got a deal on the chair-and the suitcase!!! Your decision is a tough one. Is most of the furniture in your house painted? Would you like a "new" look with this original finish? You could make it stand out the way it is with some beautiful fabric...yikes!! Good luck. Thanks so much for joining me:) I loved seeing it all again. Great finds! I think the chair looks great, looking forward to seeing any changes you make! Wow. That chair for $20.00 is the find of the year! I've bought things with the sole purpose of painting them in mind and after I get them home and live with them I change my mind and don't want to lose the wood look. I think with that chair you can go either way and not make a mistake. I just found your blog and WOW! I'm speechless (well, almost)! You obviously don't need anyone's advice, but since you asked, I wouldn't paint the chair. How about different coordinating fabrics on the seat and back?